Hatters boss Nathan Jones was thrilled with his side’s dealings on transfer deadline day after they made three new signings to bolster their push for promotion. The Town chief was a busy man, paying undisclosed fees to bring in Lloyd Jones and Jake Jervis from Liverpool and Plymouth Argyle respectively, while also adding Ipswich Town’s Flynn Downes on loan too. When asked if he was happy with the business done, Jones said: “Massively. We’ve always said that we want to strengthen in every window and we have strengthened in every window since I’ve been here. “To be fair to the club, they never fail to back me in anything that I ask for or if we put something out, they always try and get the best that’s available. Jones also confirmed that he managed to secure exactly who he wanted on the day too, as he continued: “There were options and we had number one targets like Jake was a number one target for us and we went in and got him. “Lloyd we earmarked him a little while ago and that was kind of in place, just getting the deal done with Liverpool. “And then Flynn was a little bit of a surprise one really. I’m not saying we desperately needed a midfield player, having known the fact they’d signed Stephen Gleeson which meant the competition in their midfield area is very strong. 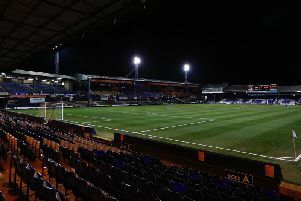 The new additions takes Hatters’ squad up to a hefty 31 players now, and Jones confirmed a few will leave the club temporarily to reduce the size, adding: “It’s slightly large on numbers, a lot of the younger ones we will look to get out on loan now for experience, as it’s the right time with us being out of the Checkatrade Trophy.